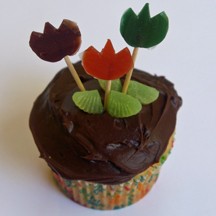 Fruit leather can be cute into cute shapes, as evidenced with these fun tulip cupcakes. They can double as a pretty flower centerpiece at spring parties. What You Need: 1 cupcake; chocolate frosting; Stackers fruit snacks (by Betty Crocker, or cut with cookie cutters and/or scissors); scissors or knife; 2 green leaf gels; 3 toothpicks. How to Make It: Using knife or scissors (supervise children), cut leaves in half and cute two notches on each fruit roll circle to form tulip shapes. Stick toothpick into or behind tulip. (You could also “sandwich” the toothpick between two pieces of fruit roll. Stick toothpicks into frosted cupcake. Add half a leaf to either side of two flowers. I first saw the lollipop flower concept in a magazine — I think Martha Stewart’s. I used Airheads candy to make the leaves, but you could use Starburst, spearmint gum or even spearmint leaves. What You Need: 1 cupcake; white frosting; green sugar; 2 Dum Dums (or other round) lollipops; green Airheads or other moldable candy (or cut up green gum or gumdrops). How to Make It: Frost cupcake. Sprinkle with green sugar for grass. 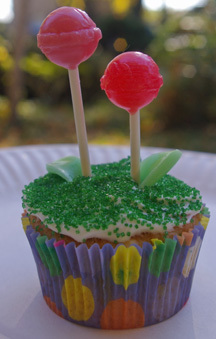 Stick two unwrapped lollipops or suckers, staggered, in top of cupcake. With clean hands or gloves, mold Airheads into leaf shapes (pointy ovals) and place near bottom of flowers. Who needs fondant and fancy piping techniques when you have fruit rolls and mini M&Ms? 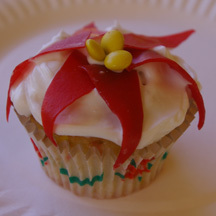 These red poinsettia cupcakes will brighten up your Christmas cupcake array. What You Need: 1 cupcake; white frosting; red fruit roll; 3 yellow mini M&Ms; knife. How to Make It: Frost cupcake. Using knife, cut fruit roll into 6 long triangle shapes for poinsettia petals. Arrange with wide ends toward center as shown. Place mini M&Ms in center. Grab a star tip and make a field’s worth of these sweet sunflower cupcakes. 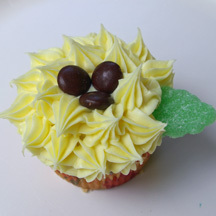 What You Need: 1 cupcake; yellow frosting (I used Pillsbury’s Spring frosting from a can); 3 brown M&Ms; candy spearmint leaf; scissors; pastry bag with coupler and star tip, or use tubed icing with tip. How to Make It: Frost cupcake. Use pastry bag or tube to make concentric rows of stars, working from the rim of the cupcake inward. As you pipe the stars, don’t stop squeezing as you pull away, so they form nice peaks. 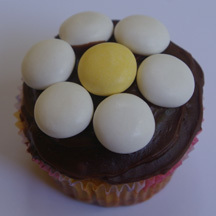 Leave small area not frosted in center of cupcake and add three M&Ms. Cut spearmint leaf in half or thirds (so it’s lighter and you can use it on two cupcakes) and place on edge of cupcake. 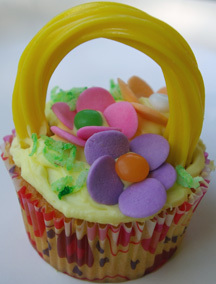 Here’s a pretty basket for Mother’s Day that includes a cute handle made from licorice. What You Need: 1 cupcake; yellow frosting; shaved coconut tinted green; large confetti sprinkles (these are by Wilton); small candies or mini M&MS; colored licorice stick (this is a Twizzlers Rainbow Twist). How to Make It: Frost cupcake. Arrange large confetti sprinkles in flower shape, with five petals each, and place smaller candy in the center. Fill in with tinted coconut. Insert ends of licorice in either side of cupcake for handle. Most moms would love to be presented with tasty, pretty cupcakes on Mother’s Day. But if you’re not up for fancy basketweave cake decorating techniques, try these easy flower basket cupcakes. 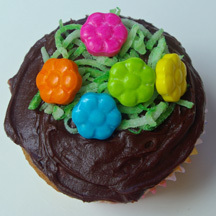 What You Need: 1 cupcake; chocolate icing; shaved coconut tinted green; candy flowers (any kind). How to Make It: Frost cupcake. Carefully position coconut grass in a dome shape so that what’s left (the brown background) is in the shape of a basket with handle. Add flowers and you’re done!